Check out this neck control! Such strength, such might. He can also release gas like a grown man. As I type, I can hear the bassinet vibrating with his farts. His burps sound like he's trying to win a contest. Smiling and jabbering are my favorites of his new activities. He smiles in response to mirrors, The Itsy Bitsy Spider, and his sister. 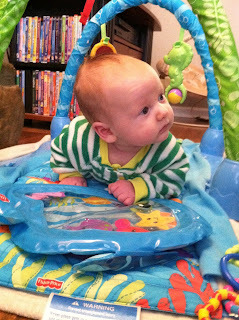 We are working to discover a new routine that adapts with his changing abilities. Every day it seems like he can do something else. I'm enjoying the non-mobile time for now, since he will likely be rolling, scooting and crawling before I know it and I'll have to baby-proof the house again. And I didn't exactly enjoy having a lock on the toilet seat. The best piece of advice I received during this pregnancy was to make CeCe feel like a big helper. I wasn’t sure how much a 4-year-old could actually help, but Ezra is almost 7 weeks old now and his big sis has become a master at many new tasks. I try not to overwhelm CeCe with requests, because we don’t want her to resent her brother or feel like Cinderella. But there are plenty of small chores an older child can do to feel helpful. And some of them are even fun for her! Pick out the baby’s clothes. CeCe loves picking out her own outfits, so this task is exciting for her. I tell her what outfits are weather appropriate for the day and then let her choose. She can also put on his socks and help snap his buttons. Go Grab a “_______”. If you need a diaper, a clean pacifier, or a burp cloth, the older child can be the runner. I tell CeCe I will time her and she races off to grab what I need. She’s always trying to beat her record time. Play Teacher. While I cook dinner, I ask CeCe to teach the baby something. 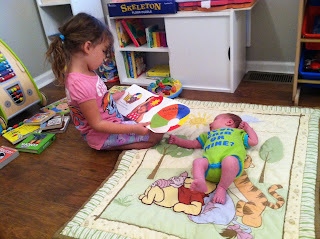 She can read him a book, sing a song, or hold up some of her artwork and describe it to him. Be a Role Model. We would have assigned certain chores regardless of a new baby, like putting away toys or setting the dinner table. But with a baby in the house, we remind CeCe that she sets the example for her little brother. He is always watching her so it’s important to follow the rules. Snuggle with Mom. If your child likes to play independently, that is fantastic. If they need more attention, then use feeding time to cash in on that. While Ezra is nursing, I ask CeCe to snuggle up with us. She can pick out a show to watch, a book to read or just talk to me about her day. CeCe reads to her little brother while Mom is cooking. We have days when CeCe doesn’t want to be a helper, but most of the time she loves being the “Baby Watcher.” What ways do you involve an older sibling with a new baby? August 24, 2015 was the day we welcomed our sweet son to the world. 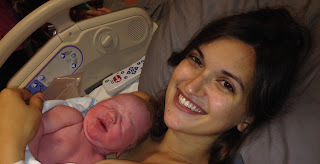 Although this was our second time around, his birth was so very different from that of our daughter 4 1/2 years ago. 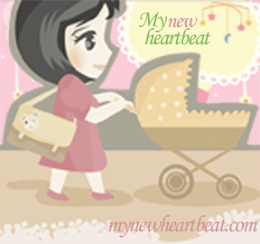 I woke at 4 a.m. on that Monday morning with very strong, but irregular, contractions. At 6 a.m. I told my husband to go on to work after dropping our daughter off at school. After all, labor with her lasted for 14 hours. No reason to spend all day waiting at the hospital. But at 8 a.m. he called my cell phone to ask if I was sure I didn't want to go to the hospital. I responded in something akin to a wild animal noise as I was getting through vicious contractions that had suddenly jumped to 3-4 minutes apart. In addition to my wonderful husband, one of my best friends also acted as a birth partner. Aunt Meg met us at the hospital and brought with her a yoga ball I never had the chance to use and a sense of calm. Having two people to share these moments was a huge relief. I had one person to hold my hands if the other needed to use the restroom, or one to rub my back while the other went to grab me some water. I was never left without support for even a second. Once the anesthesiologist placed my epidural, the nurse went to check my dilation and realized the water sac was protruding from my body- the baby's head was so low he was pushing it out. In other words, I was totally ready to push and the epidural had just barely numbed my lower body. 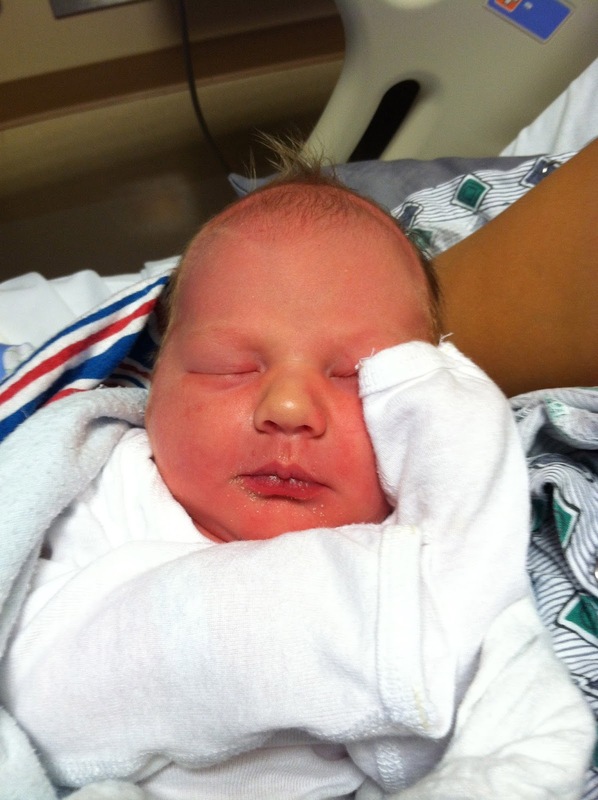 We named him Ezra Michael. He was 8 pounds, 20.5 inches of pure joy. His big sister adores him as much as we do. The past six weeks have been sleepless for me, but I can't imagine life without both my babies now.